← bug man v2 for E.C. I’ve been working on E.C. v2. and have a lot of issues/problems bubbling up. I’m not posting them here to ‘design by committee,’ I just thought it might be interesting for some people to see behind the scenes of how I do this. If you are reading this and don’t know what Exquisite Corpses is: E.C. is a somewhat unusual monster book I published in an abbreviated form via Lulu a few years ago. In 2012 a new and improved version will be published by LotFP. The book has a lot of pictures of monsters divided into three sections (head, body and tail/legs). Each drawing is split along the seams, creating tabs you can flip back and forth to make new hybrid creatures with different heads, bodies and legs/tails. Just by flipping tabs you can create 64,000 different critters. Read more here. Here we took the head of a one legged cyclops creature (I call it a “cyclopskiapod”), the body of a dragon/wyvern creature and the legs/tail of a gargoyle and added them all together to make a new creature with a one-eyed head, dragonny wings and clawed feet and a tail. The book will tell you stuff like the Cyclops head will have poor depth perception, the dragon body can fly and the gargoyle legs can grab and claw with the feet (examples). There will also be more tables that will allow you to add more qualities. You can generate your creatures by picking the parts and powers you want or rolling dice. Right now I’m struggling to edit the text the way I want it. Each entry has to be unique and after working for a while I get tapped out of ideas, so I keep having to work on it till I am not coming up with good ideas, putting it down, coming back to it, etc. I’m hoping to have the text more or less ‘done’ by the new year. 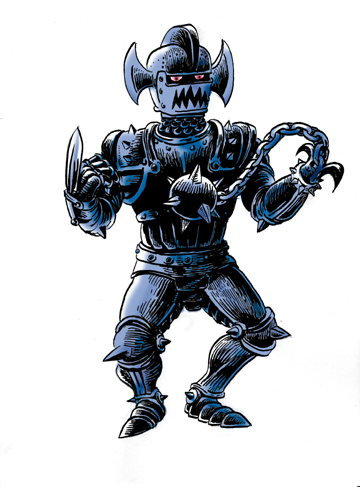 Obviously, the old ‘armored fiend v1’ has a wonky left leg that is supposed to look like he is stepping forward (I need to repaint that) and the new version is an ink drawing colored on the computer, but right now I’m grooving a lot more on the more comic-bookish new one than the painterly old one — not just because his legs are better, either — I just like the more graphic ‘look’ of it better right now. But I have to mull it over, and, of course, talk about it with my publisher. But I thought since people have been asking they might like a behind the scenes look. 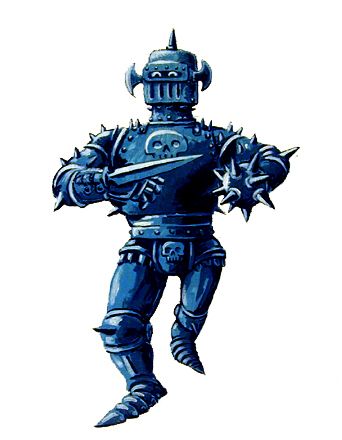 BTW, an ‘armored fiend’ is a monster of my own creation — it’s basically a fanatical warrior who has had weapons and armor permanently mounted to their flesh. They never give up or surrender and it’s hard to do things like knock their weapon out of their hand because, more often than not, their weapon IS their hand. Like Edward Scissorhands but more medievalish. Cool. I was wondering what ever happened to this project as it has been a bit since I heard any news. I do like the v2 fiend better as well. I like the new robot better. The shading gives it a nice look, and it does appear more menacing and less silly (not that silly is bad per se). Just my two coppers. I too prefer the new version; plus the Armored Fiend was one of my favorite monsters from Beastmaster! Any chance to realize this concept in 2014? Looks cool!